Peptides consist of two or more amino acids. 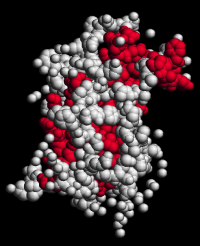 Polypeptides and proteins both contain ten or more amino acids, but peptides consisting of more than fifty amino acids are classified as proteins. as glycogen and fat. Fasting decreases insulin production. Glucagon 29 Increases blood glucose level. Leptin 167 Its presence suppresses the feeling of hunger. regulates development of the body. Growth hormone levels increase during fasting. Peptide hormones are produced by the endocrine glands (pituitary, thyroid, pineal, adrenal, pancreas) or by various organs such as the kidney, stomach, intestine, placenta, or liver. Peptide hormones can have complex, convoluted structures with hundreds of amino acids. The following graphics illustrate the chemical structure of human insulin and its three-dimensional shape. Insulin is made of two amino acid sequences. The A-Chain has 21-amino acids, and the B-Chain has 30-amino acids. The chains are linked together through the sulfur atoms of cysteine (Cys). Peptide hormones are generally different for every species, but they may have similarities. Human insulin is identical to pig insulin, except that the last amino acid of the B-Chain for the pig is alanine (Ala) instead of threonine (Thr). The genetic code in DNA (deoxyribonucleic acid) provides the instructions for building proteins. In the 1960s, Marshal Nirenberg at the National Institutes of Health (NIH) deduced how DNA is mapped into proteins. DNA consists of long molecular sequences containing four nucleotide bases: Adenine (A), Cytosine (C), Guanine (G), and Thymine (T). Each combination of three bases, a DNA codon, corresponds to one specific amino acid. Since there are 64 different 3-base combinations and only 20 amino acids, some combinations do not have unique mappings. The genetic code applies to the vast majority of genes in animals, plants, and microorganisms. The same codons correspond to the same amino acids and to the same START and STOP signals, but in some rare cases one or two of the three STOP codons are assigned to an amino acid instead. The chromosomes in the nucleus of cells consist of long chains of DNA that encode genetic information. A sequence of DNA that corresponds to an inheritable trait is called a gene. DNA forms a double helix in which the nucleotide bases are attached to deoxyribose units linked through phosphate groups. The bases in the center of the DNA helix always occur in complementary matched pairs, with cytosine linking to guanine and thymine linking to adenine through hydrogen bonding (shown as dotted lines). James Watson and Francis Crick described the structure of DNA in 1953, and received the Nobel Prize in 1962 for this work. The nucleotide bases in the center of the DNA helix are flanked by deoxyribose units linked by phosphate groups. The figure on the right represents oxygen as red, nitrogen as blue, and phosphorus as orange. The mechanism for producing proteins is analogous to offset printing where the image on a printing plate is covered with ink and transferred as a mirror image to a rubber blanket which is then pressed against a sheet of paper to produce the final image. The nucleotide sequence of DNA is not used directly in protein synthesis. Instead, the DNA molecule is transcribed into a complementary sequence of bases, called messenger ribonucleic acid (mRNA), which is then used for protein synthesis. How are peptides formed? Transcription begins when the DNA double helix hydrogen bonds break and each DNA nucleotide base links with a complementary matching base to build the mRNA molecule. Guanine links with cytosine and cytosine with guanine. Thymine links with adenine, but adenine, which would normally link to thymine, links with Uracil (U) during transcription. As an example, the DNA sequence GATACC is transcribed into the complementary mRNA sequence CUAUGG which builds the amino acid sequence Leu-Trp. Ribosomes, which are large and complex molecular machines found within all living cells, build the proteins by linking amino acids in the order specified by messenger RNA. The table below shows the correspondence of the amino acids and the mRNA codons. the amino acids in protein data bases. when it occurs at the beginning of a gene. Amino acid analysis of food products report cystine instead of cysteine. Cystine is an amino acid that is formed from the oxidation of two molecules of cysteine. Egg white protein is considered to have one of the best amino acids profiles for human nutrition. Plant proteins generally have lower content of some essential amino acids such as lysine and methionine. Soy protein is one of the best plant proteins, but nevertheless, the most prominent difference in this chart is the proportion of the essential sulfur-containing amino acid methionine. Egg white protein has approximately three times more methionine than is found in soy protein. The yeast information is for "brewer's yeast" (Saccharomyces Cervisiae). The Institute of Medicine recommends a minimum dietary consumption of 0.8 grams of good quality protein per kilogram of body weight. There are several factors that influence the nutritional value of a protein source including the metabolic availability of the essential amino acids. If the content of a single indispensable amino acid in the food is less than an individual's requirement, other amino acids cannot be used for normal protein synthesis even when the total nitrogen intake level is adequate. Thus, the "limiting amino acid" will determine the nutritional value of the total nitrogen or protein in the diet. Studies have shown that more soy protein might be needed to maintain nitrogen balance when compared to egg-white protein, and that the difference may be eliminated by the addition of methionine to the soy diet. This indicates that sulfur amino acids can be limiting in soy. Similarly, the limiting amino acid in wheat protein is lysine. The Recommended Daily Allowance (RDA) for protein is estimated for people consuming complete proteins that prevent negative nitrogen balance due to the inadequate intake of limiting indispensable amino acids. The RDA recommendations also assume that the diet has enough nonprotein energy, such as carbohydrates and fats, to prevent the carbon skeletons of amino acids from being used to meet energy needs. J.D. Watson and F.H.C. Crick., Molecular structure of nucleic acids: a structure for deoxyribose nucleic acid, Nature, No. 4356, April 25, 1953. Nirenberg MW, Matthaei JH, Jones OW, Martin RG, Barondes SH, Approximation of genetic code via cell-free protein synthesis directed by template RNA, Fed Proc., 1963 Jan-Feb; 22:55-61.